Is there a better alternative to Katana? Is Katana really the best app in Word Processing category? Will Katana work good on macOS 10.13.4? 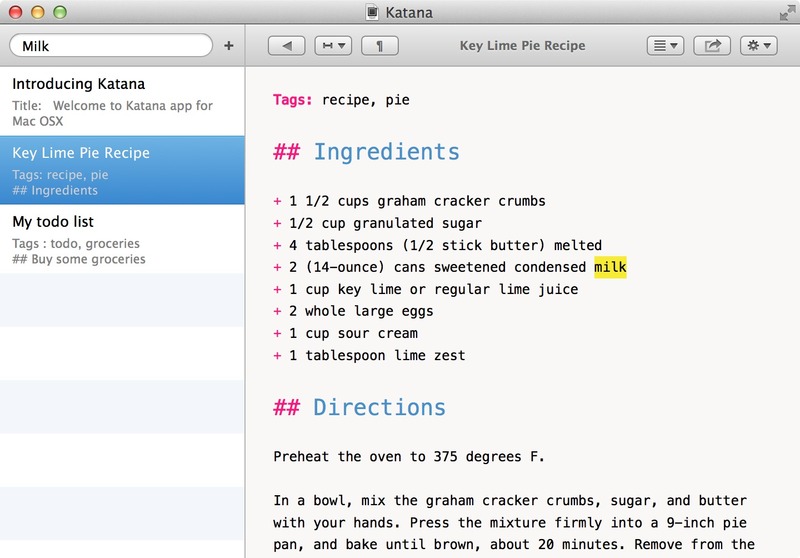 Katana is a powerful minimalist note-taking app. Simple note taking - With its simple dual-pane design, write notes effortlessly. The "distraction-free mode" allows you to focus on content to make you more productive. Plain text - Your notes are created as plain text files stored on your computer. We believe this is extremely important for those who want to keep control of their data and not rely on a third-party service to store/access notes. Katana needs a review. Be the first to review this app and get the discussion started! Katana needs a rating. Be the first to rate this app and get the discussion started! Markdown syntax - Your notes are stored in plain text, but you can easily format them as you type with the built-in markdown syntax highlighter. You focus on content, the app formats it automatically. Powerful search - The built-in search engine lets you search notes by subject, content and also by tags. It also highlights matches as you type. Customizable - You can make the app your own. All note-editor colors and fonts are fully customizable. You can also assign global system hotkeys to show the app or create notes instantly.